Please welcome Adrian Selby to The Qwillery as part of the 2016 Debut Author Challenge Interviews. Snakewood is published 3/15 by Orbit. Please join The Qwillery in wishing Adrian a Happy Publication Day! Adrian: I was eight. I wanted to write the longest story my English teacher had ever seen, and it was FIVE PAGES LONG! It was, shall we say, mildly influenced by Star Wars. I drew many spaceships firing many laser weapons, along with many, many explosions. But I knew then I wanted to be a writer. Adrian: Hybrid, I’m probably 80/20 Plotter/Pantser. Serious plotter to start out, lots of prep, bios, background, chapter summaries etc. that give me a good structure. Then as I go, I occasionally see better decisions can be made so I steer course accordingly. Adrian: Great books and my research mainly. Great books educate me on how to tell stories and challenge me to improve my prose. My research obviously informs the stories I tell. Besides that it can be almost anything. Yesterday I watched an episode of the Danish drama ‘1864’ and they introduced a character played by the marvelous actor Søren Malling, and a reference to his backstory gave me an idea for one of my characters. It could equally be a conversation with a mate in a pub that makes me think of a moment I could write between two characters. TQ: You are a producer for videogames. How has that influenced (or not) your own writing? TQ: Describe Snakewood in 140 characters or less. Adrian: Aged mercenaries of a long disbanded legendary crew race to find the survivors, and the identity of an assassin killing them off one by one. TQ: Tell us something about Snakewood that is not found in the book description. Adrian: Snakewood is told in a ‘found footage’ style, a collection of reports, interviews and journals with multiple narrators, including the assassin’s. 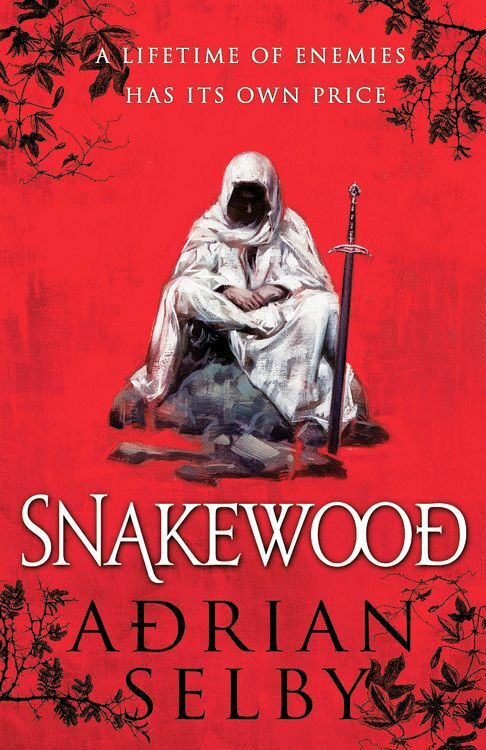 TQ: What inspired you to write Snakewood? What appeals to you about writing Fantasy? Adrian: I’ve loved epic fantasy since I read The Hobbit at the age of ten. Then I started RPGs with some likeminded mates and it blossomed from there. I always wanted to create my own fantasy world, but the world of Snakewood evolved from my desire to have magic based around a world’s plant life, where imbibing concoctions of plant could make you almost superhuman. But, like any hard drugs, a price is paid for this power, which interested me a lot, so I was drawn to tell a story about old soldiers, damaged by these brews, having to face a threat greater than any in their prime. TQ: What sort of research did you do for Snakewood? Adrian: I remember one particular Sunday afternoon, when working out the bio for a young abandoned princess, I researched defensive knife fighting techniques and the properties of a good dairy cow. Thank you, Youtube ☺ More generally I researched many aspects of medieval military logistics and tactics, poisons and remedies, the history of trade, sailing, making moonshine, taxation and economics, alchemy, the list goes on and on, a thousand snippets of information about the things I specifically wanted characters to do or know. Adrian: They were all fairly hard because I’m an inexperienced writer! I found the character Kailen a challenge because he is meant to be a genius, a step ahead of everyone, so it was how to put across that surety and intelligence without him coming across as a bore. The plot thus precludes his actions having the foregone conclusions he expects, so that hopefully keeps him interesting. Gant was also very hard to write, mainly because I wanted to tell his story in a vernacular, as though he wrote it, complete with grammatical inconsistencies and errors. Keeping these ‘mannerisms’ consistent, but not perfectly consistent, especially while ensuring they didn’t bleed into the other narrators’ modes of expression, was a constant challenge. 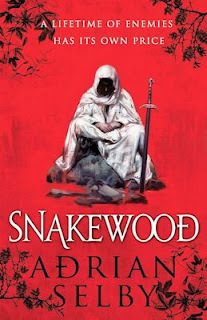 TQ: Which question about Snakewood do you wish someone would ask? Ask it and answer it! TQ: Give us one or two of your favorite non-spoilery quotes from Snakewood. A groundbreaking debut fantasy of betrayal, mystery, and bloody revenge. 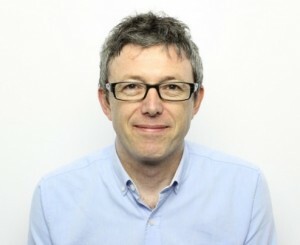 Adrian studied creative writing at university before embarking on a career in video game production. He worked for several big-name studios as a producer, before settling down to more conventional work in IT project management. He is a Tolkien fanatic, and online gaming addict, and lives with his wife and family on the south coast of England.